Primary school pupils in the Borders will have the opportunity to participate in an opera based on Robert Burns’ iconic poem Tam O’ Shanter. Scottish Opera’s annual Primary Schools Tour hits the road in January 2017 with The Tale o’ Tam O’ Shanter, a show created to reintroduce young people to the works of the celebrated Scottish poet. Written especially for children in primaries 5, 6 and 7, the fast-paced adventure features original lyrics by Ross Stenhouse and music by Karen MacIver, who also wrote the music for Scottish Opera’s popular family show, The Little White Town of Never Weary (2016), and The Cabinet of Dr Caligari (2016), a specially composed piece for Scottish Opera’s youth company, Connect. The show follows a farmer named Tam O’ Shanter as he makes his way home from Market Day with his faithful horse Meg. As the night grows darker, the rain falls and the wind shrieks through the branches of the trees, he finds himself outside the church where he discovers a coven of witches dancing. Fascinated, Tam stops to watch, but suddenly one of them spots him, and he and Meg must run for their lives. 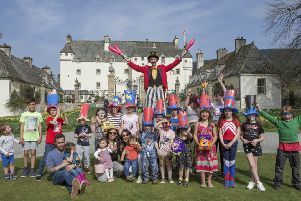 Scottish Opera’s director of outreach and education, Jane Davidson said: “Our children’s operas make learning both enjoyable and challenging, giving pupils the opportunity to participate in a high-quality, day-long music theatre workshop that ends with a performance for parents and guests.